Dehydrated Dog? Is Your Dog Dehydrated? Do you have a dehydrated dog? Do you have a dehydrated dog in your home? Would you know how to tell if your dog was dehydrated if you needed to? This is one of the many symptoms of loads of illnesses that your German Shepherd can get and it is very important that you be able to diagnose it on your own. Did you know that in some cases that dehydration can even be fatal? It's true. Very scary and true! And if you can prevent dehydration you can even help your dogs own immune system to fight off most diseases even better. It is really important for your dog not to become dehydrated in the first place. Keep plenty of clean, cool water out for you dog at all times. Prevention is key but sometimes dehydration cannot be avoided so lets learn how to test for dehydration in your own German Shepherd Dog in the first place. 1) Check the dogs skin first. Lightly pinch the dogs skin and see how quickly it springs back in to its natural place. Normally it should go back into place in just a few seconds - I'd say normally less than 3 seconds. If the skin stays "tented" and does not move back into place rather quickly then your dog is dehydrated. 2) Next, open your German Shepherd's mouth and check its gums. This is another great indicator of whether or not your GSD is dehydrated. Here's how: Lift your dogs outer lips so that you can see the gums (above the teeth - normally pink in color). Now, touch the dogs gums with your finger firmly, but not too hard, to the gums. When you do this it temporarily pushes blood in the area you're touching out of the small blood vessels. Next when you remove your finger, the blood should move back into that spot in less than 2 seconds. This is called Capillary Refill. If you have a dehydrated dog then the blood returning back to that tiny area will be slower. 3) Check your dogs eyes. Your pet's eyes may be sunken back into their head if they are dehydrated. 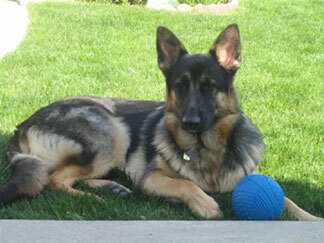 4) Another thing to check are your German Shepherds gums. They'll probably feel dry to the touch or maybe even tacky in a dehydrated dog. Normally if you pull your finger away from the dogs gums they will feel wet. In a dehydrated dog, your finger will probably stick to the dogs gums. How Do You Treat a Dehydrated Dog? Here are a few suggestions to treat your dog and get some liquid in it if you feel it may be dehydrated. First, try feeding your dogs a few ice cubes. Some German Shepherds will enjoy licking ice cubes if they are dehydrated, even if they don't want to drink water. You can also try floating ice cubes in their water bowl. Now if your dog is more severely dehydrated drinks loaded with electrolytes in them such as "Pedialyte" are a great choice. You will have to give it to them and a needle-less syringe or a turkey baster works really well in these type of cases. Here's how to do it: insert the tip of the syringe into the center of your dogs mouth and tilt his head back slightly. As you do this hold his mouth closed (to keep the fluid inside) and squirt in the liquid a little at a time. Ask your vet for suggestions on how much Pedialyte to administer to your own GSD. If you are still concerned about your dog becoming dehydrated, or if it is already dehydrated, then just speak to your vet about it. In fact, I always encourage pet owners, when in doubt, talk to the vet and if your dog will not drink on its own or accept water from you then you need to take it in before it gets too dehydrated and even sicker. A dehydrated dog can be treated - just talk to your vet about more options.